Investors were dealt a mixed hand last week as four of the seven indices closed higher. Japan’s Nikkei 225 jumped 1.37% to occupy the top spot last week. 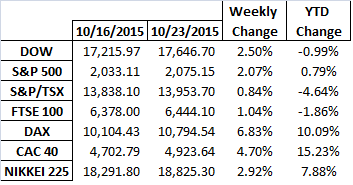 On a YTD basis France’s CAC 40 was the best performer with a gain of 14.63% followed by Germany’s DAX at +10.65%. Last week was a good week for equity investors as each of the indices ended higher. Germany’s DAX was last week’s top performer with a gain of 6.8% followed by France’s CAC 40 at +4.7%. The French CAC 40 continues to lead on a YTD basis. China’s recent rate cut and musings about further European QE could see further gains next week. Each of the indices recorded strong gains last week as bargain hunters swept the market and concerns over a FED rate rise this year seemed increasingly unlikely. Glencore continued its recovery this week, closing up an astonishing 36% which would seem to indicate overly bearish sentiment fading away (no doubt the Company’s decision to cut zinc production also played a part in the rally). The French CAC-40 is the year’s top performer with an amazing +10% return followed by Japan’s NIkkei 225 (+5.66%) and London’s FTSE 100 (+2.97%) .